When it comes to high employee turnover, many managers assume that's just how it is in their industry, or accept that it is part of the cost of doing business. But what is the actual cost of employee turnover? It’s much higher than you realize. Short-term lost productivity from 2 employees: The new, inexperienced hire has lower productivity, and the employee performing new-hire training is slowed as well. Costly errors by new hires that impact customers and take other employees time to correct. Employee turnover is also a major safety risk since new hires may not be familiar with the new work environment and safety precautions. 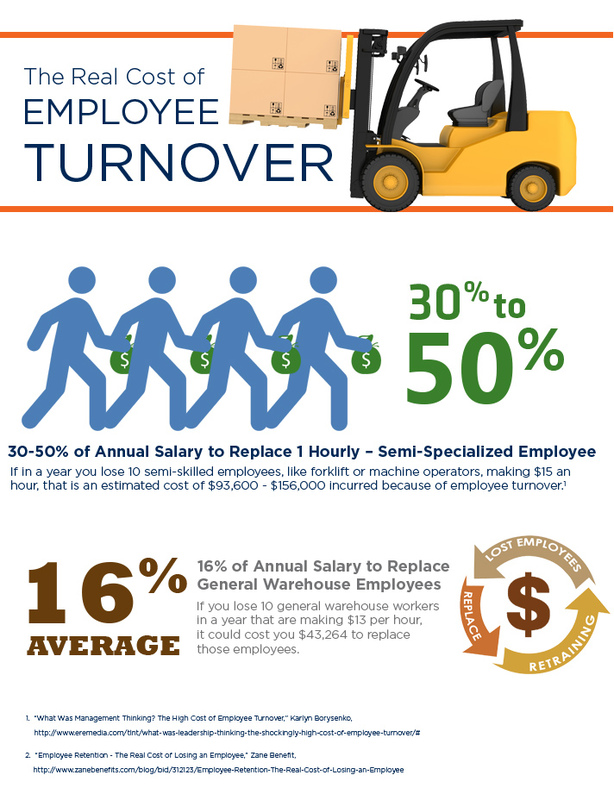 What’s the Average Cost of Turnover? Unfortunately, many managers see this data but don’t know how to address the issue. Though there are many reasons for higher turnover, especially in hourly-wage jobs, one of the biggest complaints cited for leaving a job is employee satisfaction.3 When employees don’t feel safe, comfortable, and appreciated, they become disengaged from the job. Their performance and productivity wane, eventually making them leave. Choosing cheaper protective gear that doesn’t last or adequately protect employees will cost you more in employee replacement costs and lost productivity. Spending $50 more each for 10 $13-per-hour employees, for example, may be more in upfront costs, but losing just a couple of those employees due to inadequate equipment would cost you twice as much to replace (see infographic on average cost to replace entry-level employees above). Workers in refrigerated environments have unique challenges, including uncomfortable temperatures and mandated recovery time outside of the cold. Inadequate apparel that wears out quickly or allows for cold spots will lead employees to be uncomfortable and impact their ability to perform well, leading to frustrations. Whether it’s choosing the right jacket and gloves, or the all-important footwear that is comfortable, correctly outfitting your warehouse team in cold environments may be one of the biggest factors in creating satisfied employees. You want to keep great employees who value performing well. Losing a high-caliber employee due to bad gear is a tremendous cost. One of your greatest risks may come from giving them the wrong tools and gear to do their job. After all, a great employee who strives to perform well but cannot will eventually become frustrated and leave. Things to consider in purchasing the right protective gear for the cold are whether it provides the right amount of protection while also providing a full range of motion, if it reduces recovery time, and if it provides extra functionality (like extra pockets on jackets or grips on gloves). Obviously, recordable safety incidents will cost companies money. However, employee satisfaction is also impacted by safety in the workplace. This is especially true in cold environments, where health safety is as much a concern as forklift or machine safety. Keeping employees protected from the cold, whether in the warehouse, on the loading dock or driving a truck, will enhance safety and employee satisfaction. Requiring protective gear but making the employee pay for it is a sure way to drive down employee satisfaction and loyalty; employees are more like to buy cheaper or inadequate gear for extreme cold, which leads to the issues impacting employee satisfaction mentioned above. Often when deciding on protective gear such as jackets, gloves and footwear, managers only look at the item cost and not the larger picture. Instead, managers should be thinking, “How does my choice of protective gear impact productivity, employee satisfaction, safety and costs now and in the future?" Employee turnover cannot be eliminated completely, but it can be reduced by considering employee satisfaction and how small changes in how you approach personal protective equipment can equal a large reduction of costs by reducing turnover.